1. Prepare a safe space. First and foremost, scout out a safe area at least ten feet away from your home. Keep the fryer out of garages, decks, fences, as well as a safe distance away from trees. Ensure that there will be no bystanders, children or pets nearby once you begin. In addition, having a working fire extinguisher on hand is wise, too. 2. Be careful around the oil. Once the oil gets hot, it’s easy for things to get messy. Don safety glasses, oven mitts and an apron to handle the fryer well before the oil starts to bubble. Make sure your fryer is on a flat, level space to carefully gauge the amount of oil needed. pouring too much oil in could cause the burner to ignite it if it spills out. 3. Get the temperature just right. 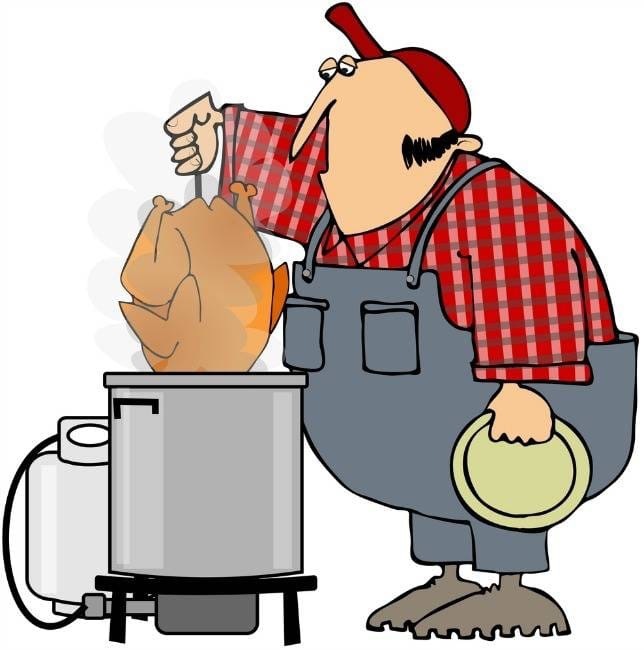 When cooking turkey parts, the oil temperature should be at 325 degrees F, according to Nicole Johnson, Butterball Turkey Talk Line expert. She adds that it may take 4 to 5 minutes per pound to reach the recommended temperatures, as dark meat should get up to an internal temperature of about 180 degrees F, and white meat to an internal temperature of about 170 degrees F, she says. Using temperature controls to monitor the blaze is must, Also take your time while frying the turkey. Slowly raise and lower the turkey into the fryer to minimize spills, and give your full attention to the process. and it goes without saying that you should never leave the bird unattended. Congratulations, you’ve deep-fried a turkey. Be sure to remove the bird from the fryer slowly, turn off the heat, and clean up your frying space just as meticulously as you set it up. After all, you’ve come too far to suffer a mistake now. And when it comes time to gather around the table, be sure to revel in every compliment your savory dish receives. From all of our Officers and Members. Have a safe and Happy Thanksgiving!